What is “Old Growth” forest? But the writers of Beyond Old Growth prefer the broader term “older forests,” saying that it acknowledges that even forests cleared or logged over the past couple of centuries have key ecological characteristics that traditionally have defined old-growth forests” and that with proper management they can acquire the values that make what we know as old growth such a precious resource. Species which typically dominate stand composition during the late stages of natural succession. These are usually the longest lived and most shade tolerant species characteristic of the climatic and site conditions within an ecosystem. On zonal Acadian Forest ecotypes they include Hemlock, Red Spruce, White Pine, Sugar Maple, Yellow Birch and American Beech; while on Maritime Boreal ecotypes and edaphically limited sites (e.g. bogs, fens, highlands, coastal) Balsam Fir, Red Maple and Black Spruce are more likely to form the climax forest. An indication of climax types can be obtained from the ecosection mapping of the Ecological Land Classification for Nova Scotia (Neily et.al., 2003), as well as from the site based Forest Ecosystem Classification of Nova Scotia (Report DNR 2011), and Forest Ecotypes of Nova Scotia (Report DNR 2011). A forest stand where 70% or more of the basal area is in trees younger than 80 years old, at least half of the basal area is composed of climax species, and total crown closure is a minimum of 30%. 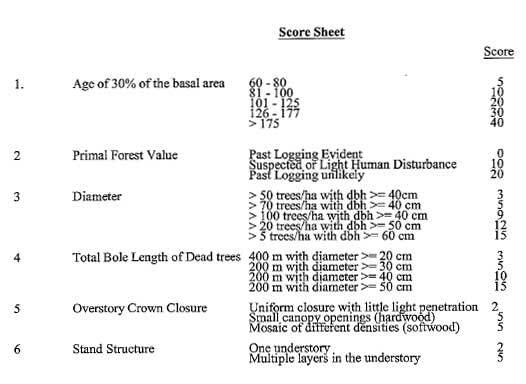 A forest stand where 30% or more of the oldest basal area is in trees 80 – 125 years old, at least half of the basal area is composed of climax species, and total crown closure is a minimum of 30%. A forest stand where 30% or more of the basal area is in trees 125 years or older, at least half of the basal area is composed of climax species, and total crown closure is a minimum of 30%. Old growth forests are dynamic and represent the shifting mosaic phase of forest development, marked by mature canopy processes of gap formation and recruitment from a developed understory. Typical characteristics include a patchy, multi-layered, multi-species canopy with trees of several age classes dominated by large overstory trees, occasional dead topped stag trees and decadent wolf trees, and the presence of snags and fallen woody debris. Ideally this stage represents a long period of ecological continuity. Any stand or collection of stands containing old growth and/or mature climax conditions. The largest, oldest, ecologically representative patches of climax-species-dominated forest on the landscape. View Nova Scotia’s Old Forest Policy for more details.